Okay. Here it is. I am putting it all out there today. Well not aaaaalll, but a secret that I have been storing inside the last few years. It's called ENVY and JEALOUSY. No, I promise, this isn't a mean spirited post! I just want to admit that I am extremely envious and jealous of what I personally call, the "New Wave" quilters. Not necessarily modern quilters, but the ones that have started quilting just in the recent years. The internet. The possibilities. The accessibility. The ease. The community. All of the things I never had when I started quilting 17 years ago. Yup. I said it. SEVENTEEN years. Hey! All of you followers that are young whipper-snappers, I see running away now! But don't! I am not mad, just so amazed every single day at the ability for a newbie quilter to just jump right in on quilting. When I first started quilting, all I had was the Singer Quilting Bible and the selection of fabrics at Big Js (my new name for Joann's). I TRUDGED my way through magazines and books to learn. I waited patiently every morning for my favorite quilt show on HGTV...which is completely gone now. This was in regards to crafts too. I would catch Martha Stewart on Oprah (before she had her own show) and hope that there was a new Carol Duvall episode on. And the SNEERS of the older women at the counter at me. No help. No suggestions. Nothing. Now? A new quilter can purchase fabric online. Can find at least 1000 tutorials on BINDING. Where was this when I was binding my first quilt?!?!? Not to mention community. 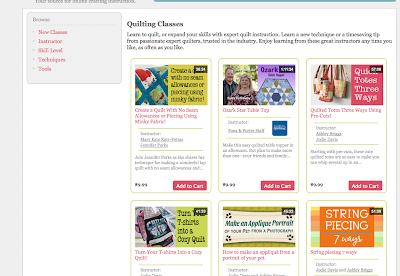 I have "met" more quilters online than I ever have in real life, not to mention more welcoming. I love that I can learn new techniques that I feared before. Enter, the giveaway. The reason that spurred by secret confession! A pretty cool website. I have had already tried a class on another online instruction site and enjoyed it very much. 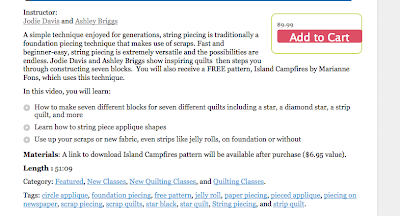 It actually changed the way I approached quilting my works. When I visited this site, I wasn't disappointed. Clean. Attractive. Simple to navigate. 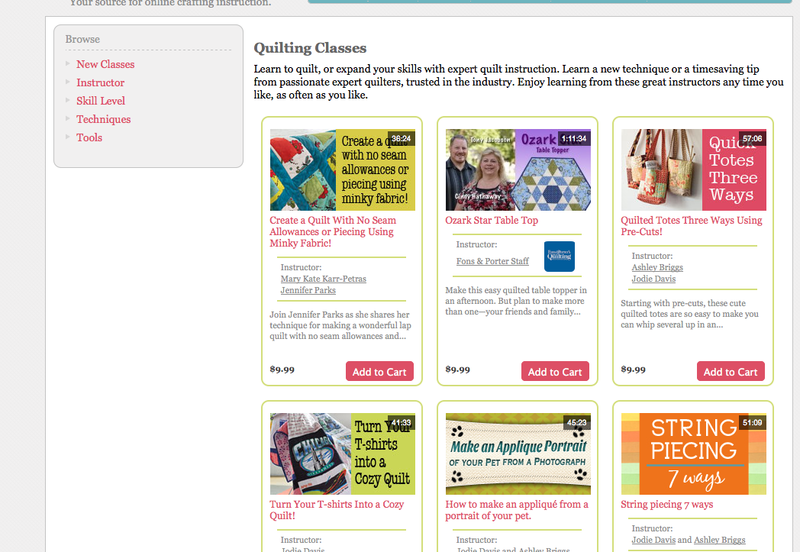 The quilting page had the option to browse by quick thumbnails or you can use the headings on the left to look for skills you are wanting to learn or hone. Or a tool that you didn't know about that could make all your troubles and worries disappear. When you open a class, you see the video at the top and a class description underneath. 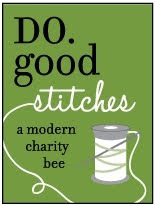 I decided that I wanted to try out the String Piecing class since I felt like it would appeal the most to my followers. The ranges are definitely beginner to advanced, and I didn't want to leave anyone out. They start out showing how to strip piece on foundation and basics, but then they go through a few ways to make a complete block/project. Why was I worried about you? Well, because I can offer one follower this ANY class FOR FREE! 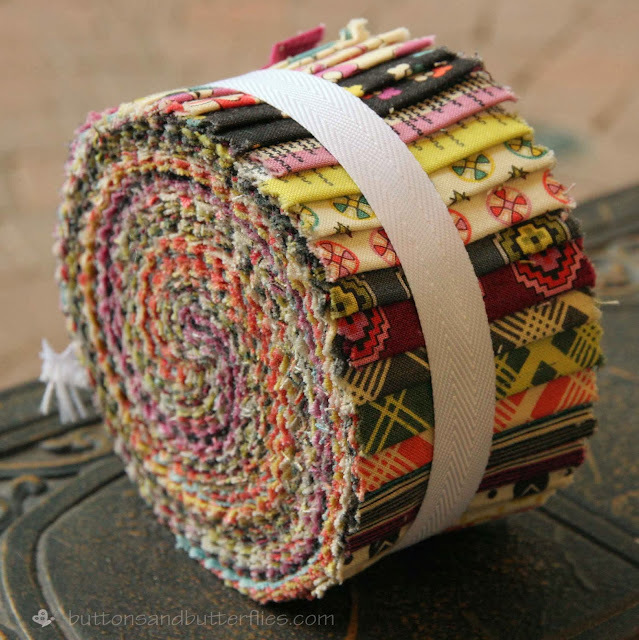 One design roll of Chicoppee by Denyse Schmidt from my stash. 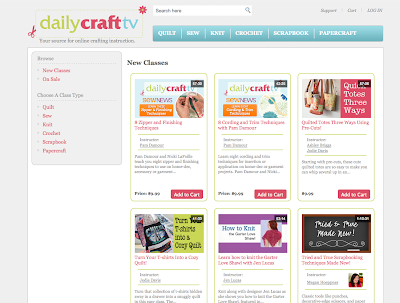 I'm asking you to go check out Daily Crafts and check out the site. Then come back and tell me what class you think you would be interested in! Open until Friday, November 15th at 11:59pm. Winner will be notified via email (and here) no later than Sunday, November 17th. Item will be shipped no later than Friday, November 22nd. So there you have it. You know my secret. I'm envious and jealous. Admitting it is the first step of the problem. I think a giveaway to the "New Wave" quilters and my beloved "Old Skool" quilters on the internet is maybe step 9?!?!? I've never heard of this site but they appear to have some great classes! I'd love to learn curved piecing- something I'm too afraid of to try. :-) and ps, Chicopee was the line I used for my very first quilt and it holds a special place in my heart. I also follow your blog via Feedly and on Facebook. Love your stuff Heidi. 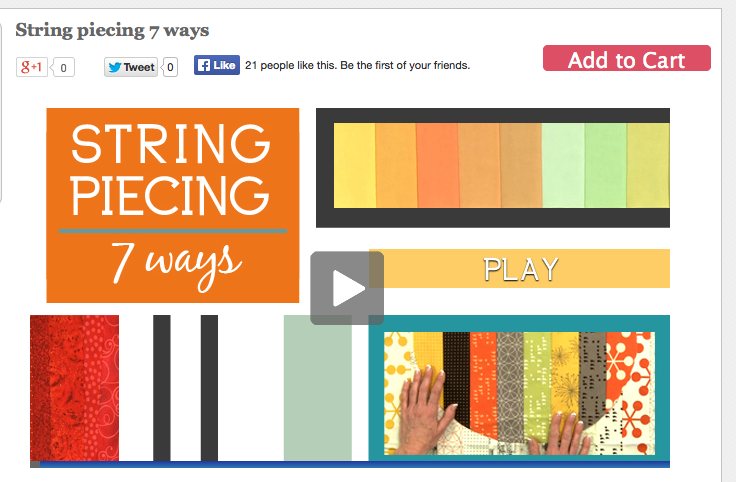 I would love to learn string piecing. 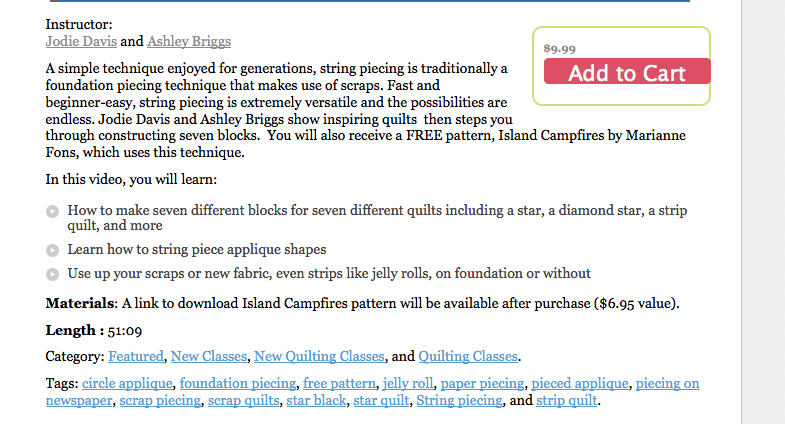 It looks like it would be a good beginners class to quilting. 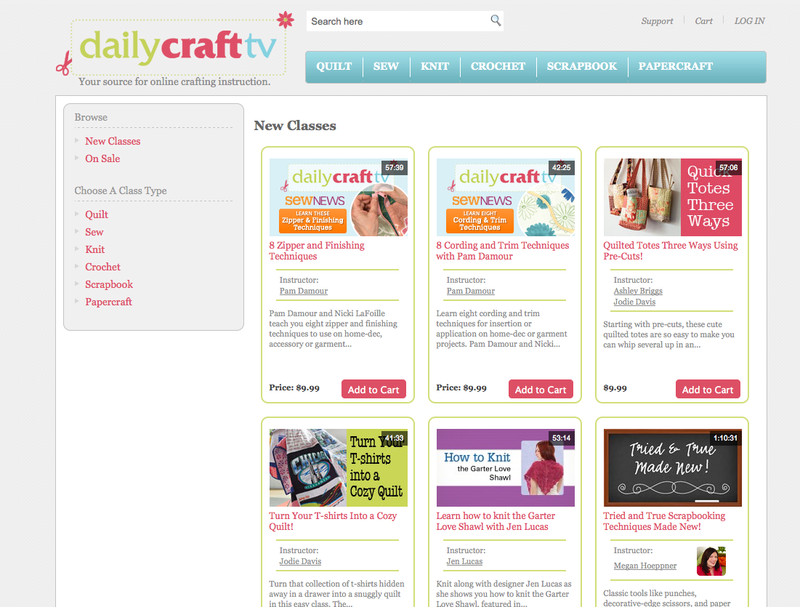 I have seen the Daily Craft tv site before but have never check it out but will look into it further. Thank you for a chance at your giveaway which is wonderful. I am interested in the "Yes, You Can Piece Curves" class. Didn't see that one coming, did ya? Ha! Only because I'm very curious about piecing them on foundation paper and want to see what she has to say about that. Second to that, the one you are giving away looks good. 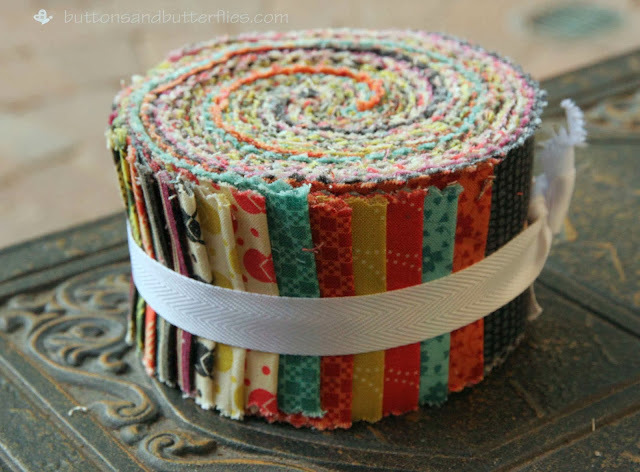 I'm always looking for things to do with strips! Thanks for the chance, my dear! I would love string piecing or worry free binding! 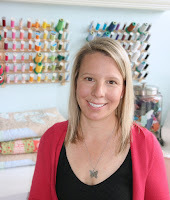 As a newer quilter I love to learn as much as I can! PS. I have been following your blog but don't know how to officially follow you!!! Jessica. You can follow by readers like Bloglovin and Feedly. By twitter, Instagram, fb page. You also can recover my posts by email. Any and all count as an extra chance! Great post! I was just checking out your blog and agreed with you. I have been quilting for over 20 years and online community is amazing. I know that is what pulled me back in and got me excited to try new things and go outside the box too!